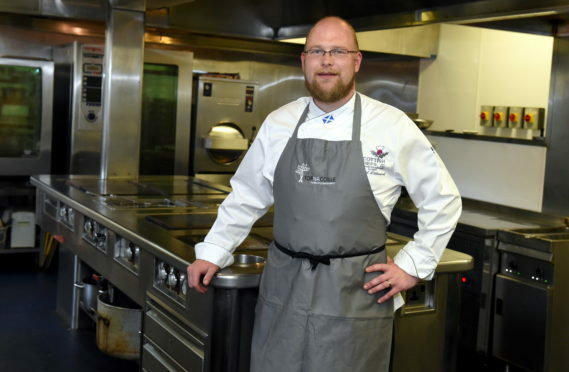 Owner and chef, David Littlewood, Tor na Coillie, hotel, Banchory. Picture by Jim Irvine. In his first column, David gets creative with soups you’ll want to eat regularly through the autumn and winter months and shared recipes for a Pea and Vanilla Soup, a Squash and Isle of Mull Cheddar soup, and a warming, winter Celeriac and Apple Soup. These taste fantastic especially when teamed with home-made bread and rolls. 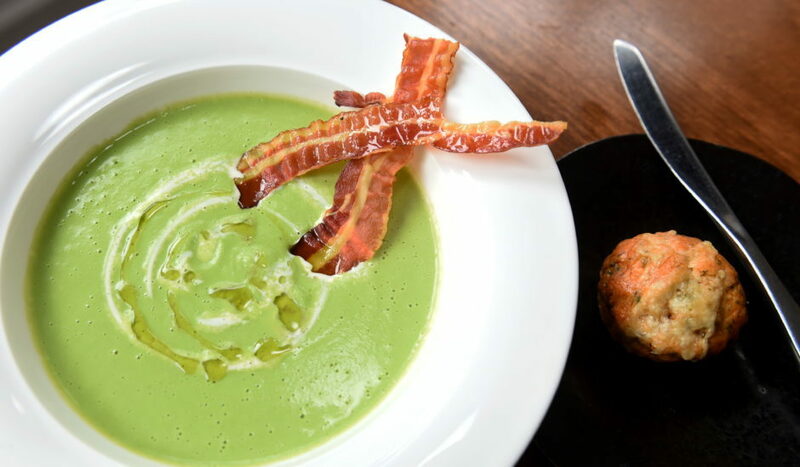 Pea and vanilla soup with a barwheys cheddar scone.<br />Picture by Jim Irvine. Rub the butter, salt, pepper, cayenne, mustard powder (if you’re using English mustard then add it later with the milk) and flour together to make the texture of rough breadcrumbs. You can do this with a mixer and paddle or dough hook to save time, or more importantly effort. Add in the grated cheese and give it a quick mix. Add the milk and beaten egg (and mustard if not using powder). Mix slowly until all the ingredients have combined to form a soft dough. Be careful not to over mix it so that the dough becomes tight and elastic. Roll out to about 1” thickness on a lightly floured surface and cut out with a 5cm cutter. It’s up to you what size you want to make but remember that smaller ones will take less time to cook. Place the scones on a greased tray or line it with parchment paper and top with more grated cheese then let the scones sit at room temperature for 15 mins. This allows the dough to relax and gives a lighter scone at the end. Bake at 175C for about 18 mins. I love the strong flavour of Barwheys Scottish cheese, but it can be swapped for almost any cheese. If using soft cheese reduced the amount. This recipe makes quite a few, depending on how big you make them, so feel free to halve it, or freeze them for another day. 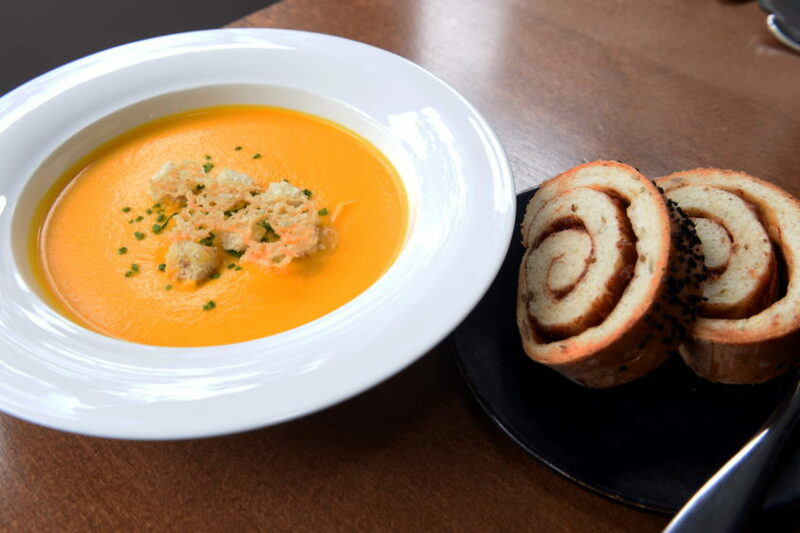 Butternut nut squash isle of Mull cheddar soup with tomato bread.<br />Picture by Jim Irvine. In a food mixer with a dough hook, mix together the flour, seeds, soft butter and salt. Warm the milk and water together with the sugar, until it is lukewarm. Stir in the yeast and sit aside until if froths up. Add the yeast mix to the flour mix and mix to form a sticky dough. Keep kneading, either by hand, or in the mixer at low speed until the dough becomes elastic and stretchy. Cover the bowl with a damp clean cloth or cling film and leave in a warm place until doubled in size. Once it is doubled in size ‘knock back’ the dough – lightly knead it a few times – and cut into three quarter to one lb pieces. Roll each piece on your worktop with a rolling pin to about 1cm thickness. Spread with the tomato paste (or chutney) and roll it up like a swiss roll, folding the ends underneath to enclose it. Place your loaves on a floured tray or on parchment paper and allow to prove again until doubled in size. Dust some flour over the top (or brush with some beaten egg yolk and sprinkle with some onion seeds) and place them in a preheated oven at 190C for around 25-30 mins. Timing may vary depending on your oven, but they should sound hollow when tapped on the bottom. Allow to cool slightly to release any steam inside before slicing thick and serving warm with your soup. Serve in a hot bowl with a drizzle of rapeseed oil and my seeded rolls, or try a dollop of basil pesto and some charcoal brioche croutons. In a food mixer with a dough hook, mix together the flour, seeds, soft butter and salt. Or you can rub it all together with your hands in a big bowl. Stir in the yeast and sit aside until if froths up. This is activating the live yeast: if the water is too hot you will kill it, too cold and it just takes longer. The best way to test is to lightly press it with your finger and when it springs back slightly, its ready for proving. Once it is doubled in size ‘knock back’ the dough – lightly knead it a few times – and cut into 50g pieces. Roll each piece on your worktop with a cupped hand to form the rolls. This does take a bit of practice, but don’t worry if they don’t look perfect to start with, they’ll still taste great! Place your rolls on a floured tray or on parchment paper and allow to prove again until doubled in size. Dust some flour over the top and place them in a preheated oven at 190C for 14 mins. They should sound hollow when tapped on the bottom.